The Bitten Word guys came up with the most genius concept recently, cooking every recipe in 6 of the most popular cooking magazines…and we were a part of it! The nice thing about challenges is that they push you to get outside of your comfort zone. 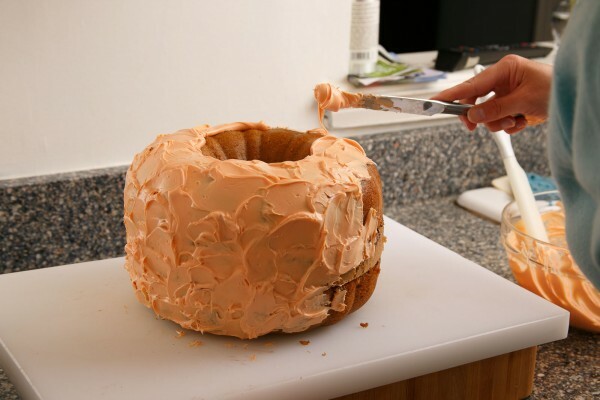 This was true with the recipe we ended up with, Candy Bucket Cake from Food Network Magazine. There is no way under normal circumstances that I would have tried this recipe. It is pretty much the opposite of everything I look for in a recipe. First off, it serves 25-30 people. 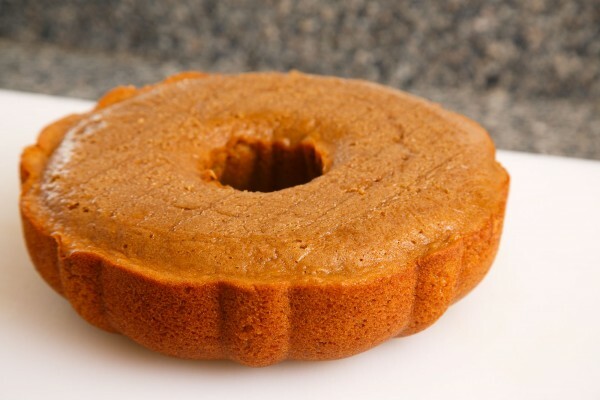 However, my main gripe is that it mostly consists of ready-made ingredients like cake mix and canned frosting, but still requires odd sized baking pans and fondant! 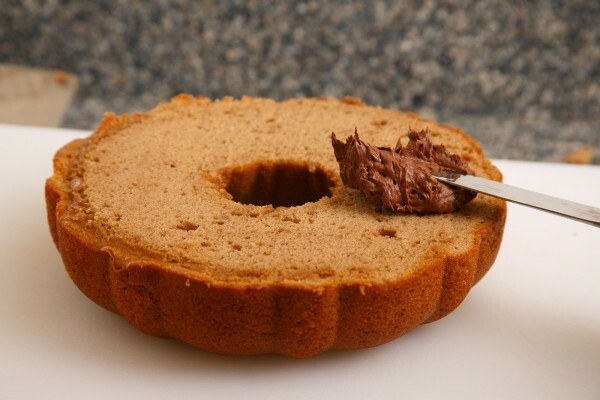 When neither Target or Bed, Bath and Beyond have an 8″ cake pan or 6 cup Bundt pan, I think the bakeware isÂ officially obscure. 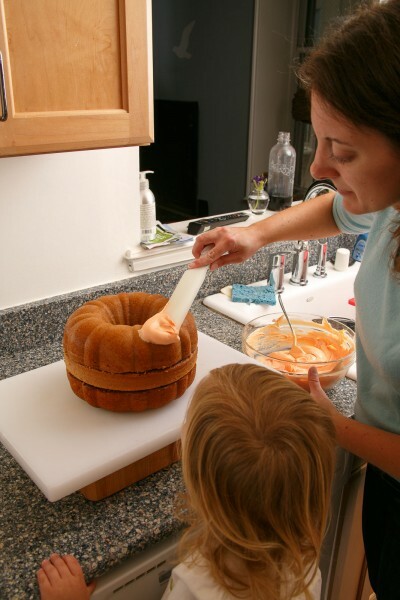 Â I had to make do with a 9″ cake pan and a 12 cup Bundt pan, and I think our cake was a bit squatter because of it. 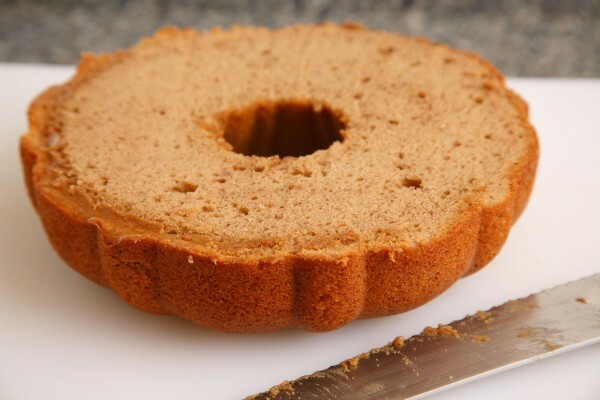 And I only got one Bundt pan and reused it…who has 2 – 6 cup Bundt pans? Don’t even get me started on fondant. That stuff is pretty much impossible to find in DC. Most insultingly, the recipe was rated as easy. This is not to say we didn’t have fun. 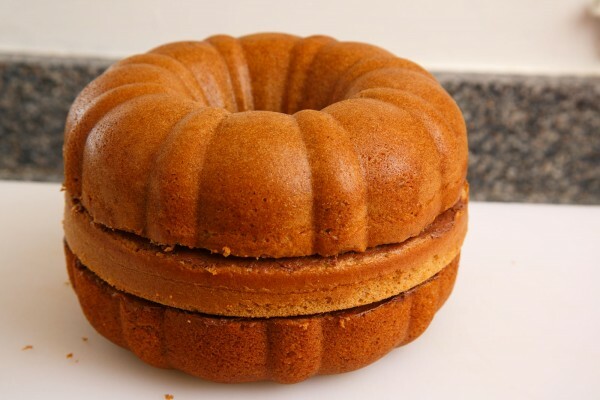 It is hard not to when you are stack’n cakes together to form a massive pumpkin and then layering on the frosting. 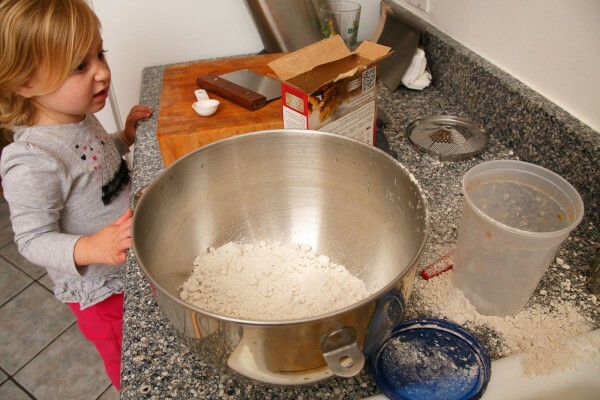 I just think the recipe authors sacrificed too much of the actual baking and are out of touch with what ingredients and equipment is readily available. The recipe itself was pretty easy. 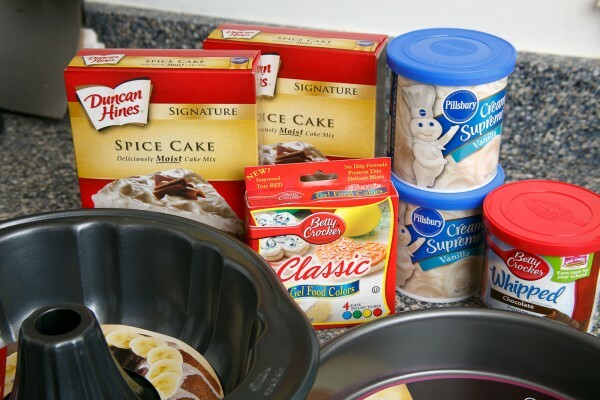 All you are doing is adding 3 ingredients to a cake mix and then using a mixer. 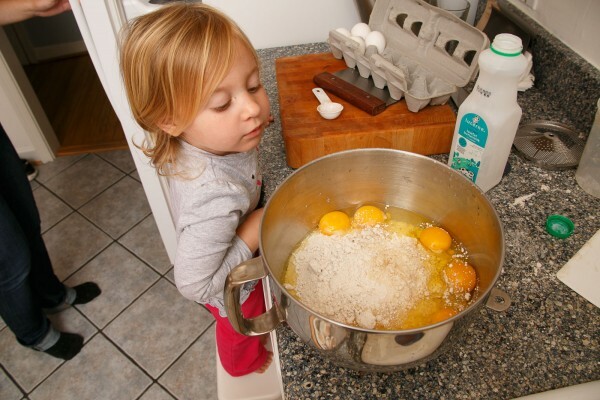 I will agree that this part of the recipe was easy. 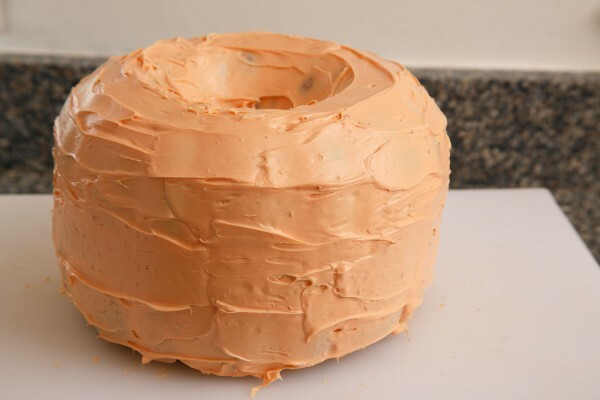 Since we were just using regular frosting instead of fondant, we didn’t get it as eye poppingly orange. 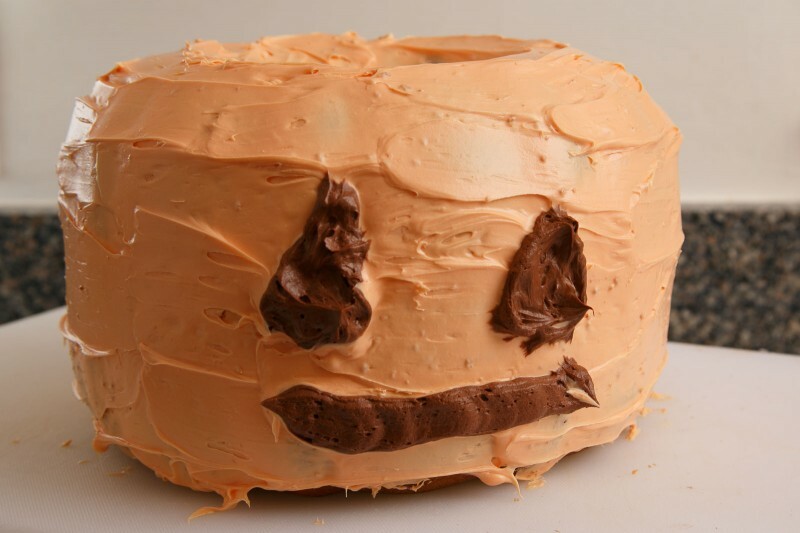 The cut-outs in the fondant define the shape of the eyes and the mouth and, as you can see, they don’t look as crisp when they done with just frosting. While our cake may look a little demented, it was a lot of fun to put together and entertained Elena on a rainy day. Not to mention it was pretty tasty! I think the Bitten Word guys came up with a great concept, I just got a dud of a recipe. 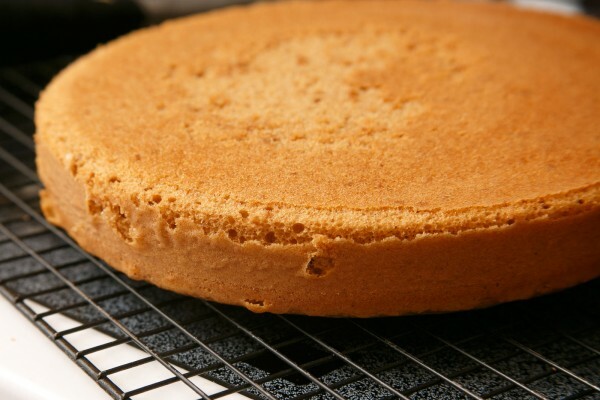 Attach the fondant strips to the cake, lightly pressing and smoothing them from the base of the cake upward. 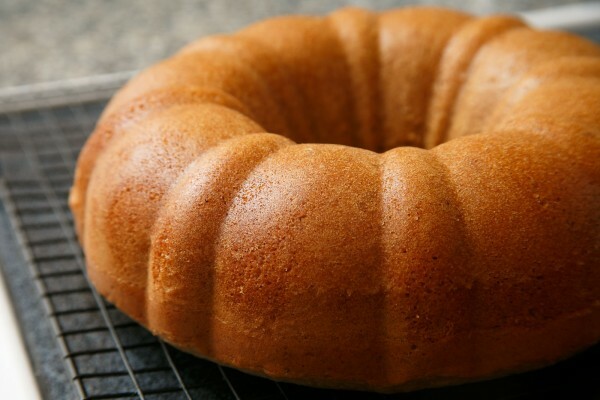 Refrigerate the cake 30 minutes. Twist the 2 strings of licorice together and insert into the top of the cake to make a handle. 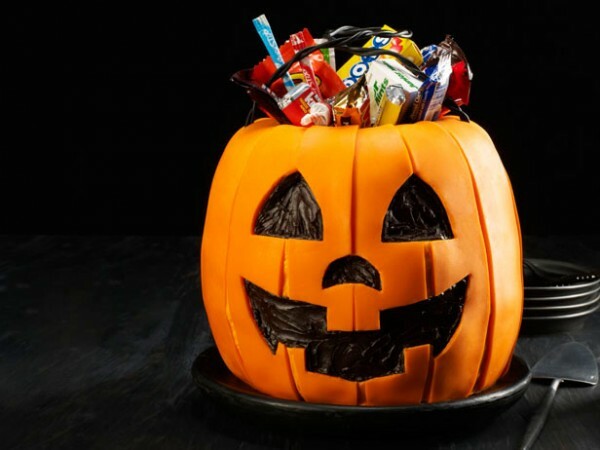 Fill the top of the cake with snack-size candy. 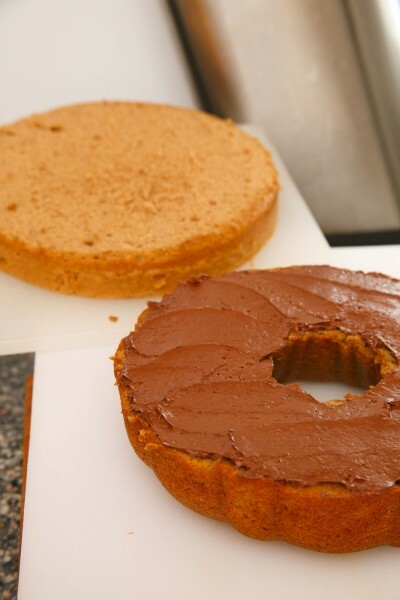 See the rounded top on the cake? 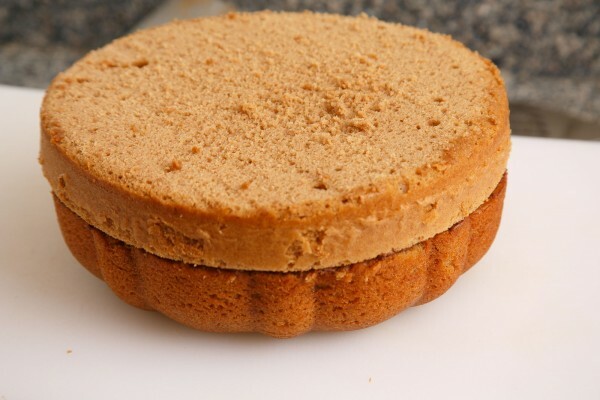 You have to cut that off all the cakes to level them and make sure they fit together. And this is how I learned that you should cut open cake mix bags instead of opening them like a bag of chips.